Day 235: The Long & Winding Road . . . Following a Leadership San Marcos event that saw Brian and nine other team members graduate through the program, we were faced with trying something new! The story on the label is certainly impressive. . .(sorry, you’ll need to find it or buy it, we won’t tell you that story) but the wine in the bottle, that IS the question. As we’ve grown to enjoy delicious Cabernet Sauvignons, when we come upon new, young wines, we get a little nervous. 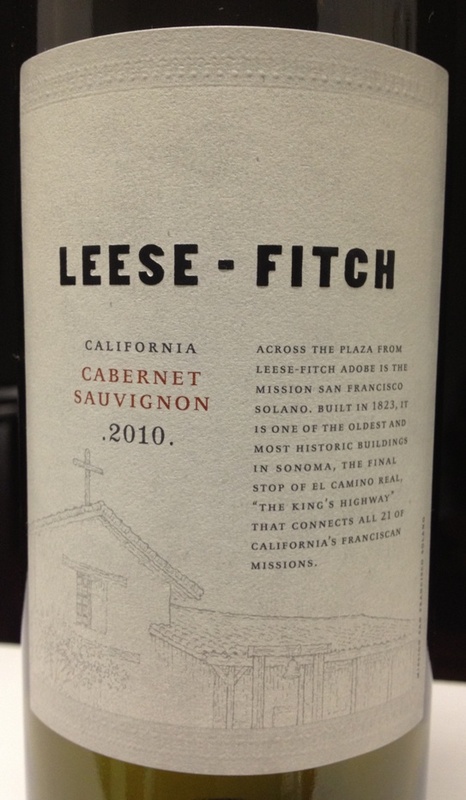 But, we shouldn’t have worried, deep purple in color, the 2010 Leese – Fitch Cabernet Sauvignon blend jumps from the glass with aromas of juicy blackberries, ripe blueberries, dark chocolate, and toasted walnuts. A lot of great Cab flavor in the mouth; currants, blackberries, dark cherry, milk chocolate, espresso, clove, vanilla and oak tastes. The finish is truly lingering with a lot of dark fruit notes as well as some great structure and integrated French and American oak flavors. Oh yeah, this one is going to catch you off guard. . .AND, with a price tag around $13 a bottle, you may want to keep some to drink now and save some to drink in a couple of years. Even though it’s labeled as a Cab…the actual concentration is a blend…79% Cabernet Sauvignon, 6% Alicante Bouchet, 5% Cabernet Franc, 4% Merlot, 4% Sirah, 1% Carignane and 1% Petite Sirah…talk about a wine-lover’s blend! WOW! Instead of taking ‘the road more often traveled’–trying wines that were well known or had pedigree; we’ve opted to take the ‘road less traveled’ or as our title suggests, ‘the long and winding road’ of new and different wines. . .these Leese – Fitch wines fit the bill to a tee and are priced right, taste right and ready for enjoying now! Whether or not you try this wine is up to you, but just remember to enjoy it responsibly and recycle whenever possible. Categories: Uncategorized | Tags: HEB, Leadership San Marcos, Leese-Fitch wines, World Market | Permalink.